eM Client for Windows 10 - A well-known program that allows you to work with e-mail, instant messengers, calendar, chat. She is engaged in receiving, processing, reading, replies, sending e-mails to sort important messages. The utility works with many mail services, integrates with standard software. 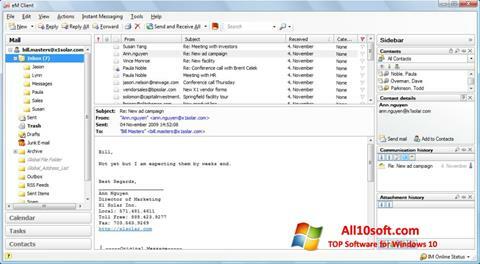 It offers a trial version of the software for maintaining two autonomous mailboxes, has a simple multilingual interface. The product has a new feature for synchronizing calendar data with notes and a task scheduler on the device. You can free download eM Client official latest version for Windows 10 in English. Publisher Software: eM Client Inc.